DAVIS, Calif. — The University of California, Davis (UC Davis), recently broke ground officially on The Green at West Village, a campus apartment project with room for up to 3,300 students. Work on the site began in December and the first 1,000 beds are expected to be available for fall 2020; the remaining beds will be completed in time for occupancy in fall 2021. 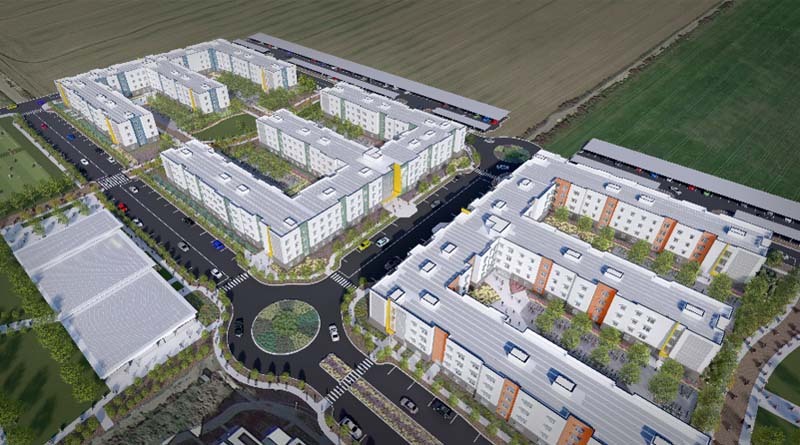 The student housing development will be part of the UC Davis West Village, which is the largest student housing construction project in the United States. The Michaels Organization of New Jersey is the developer, with architectural services by Stantec, a global design company headquartered in Edmonton, Canada. The general contractor is CBG Building Co. of Arlington, Va. The Green at West Village will comprise nine four-story apartment buildings along with indoor and outdoor community space and recreational fields. A 10,000-square-foot community building will house a fitness center, multipurpose room and student support services. The project has a goal of 100 percent zero net-energy use on an annual basis. The new undergraduate housing project is also a public-private partnership development with multiple study rooms and photovoltaic systems to provide power to the facility. The site for the construction is on approximately 34 acres to the north of the existing apartments at West Village and wraps around to the west. The university’s original request for proposals aimed for 1,875 beds. However, UC Davis, The Michaels Organization and Stantec worked together to develop a plan that cut back on space for student vehicles, allowing more residential units. The development is part of UC Davis’ new Long Range Development Plan, which projects the university will add 9,050 student beds and house 100 percent of any growth in student enrollment on campus. The development is a public-private partnership between UC Davis, The Michaels Organization and Collegiate Housing Foundation, a 501(c)(3) nonprofit organization. When construction is complete, the apartment complex will be operated by Collegiate Housing Foundation, which will hold the ground lease from the University of California. UC Davis Student Housing and Dining Services will provide on-site program and residence support services and be responsible for leasing and marketing activities. The first phases of apartments at UC Davis West Village opened from 2011 to 2013, providing space for 2,261 students. The West Village is the largest planned “zero net energy” community in the United States. The West Village Neighborhood includes the existing apartments managed by Greystar, Los Rios Community College, the Energy Hub, and soon, additional undergraduate housing at The Green.